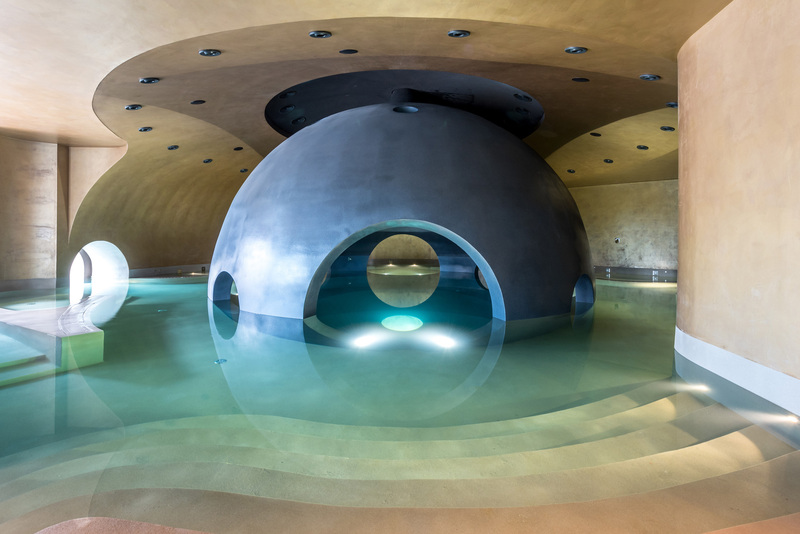 The most dramatic symbolism is reserved for Euphoria’s space-age indoor hydrotherapy pool. “Your life, your journey,” goes the motto of Euphoria. At this unique spa, the choice is yours. The genius loci (protected spirit of a place) is essential to the holistic approach espoused by Euphoria Retreat, whose uniqueness lies in its synthesis of Greek and Chinese spirituality, philosophy, and healing techniques. 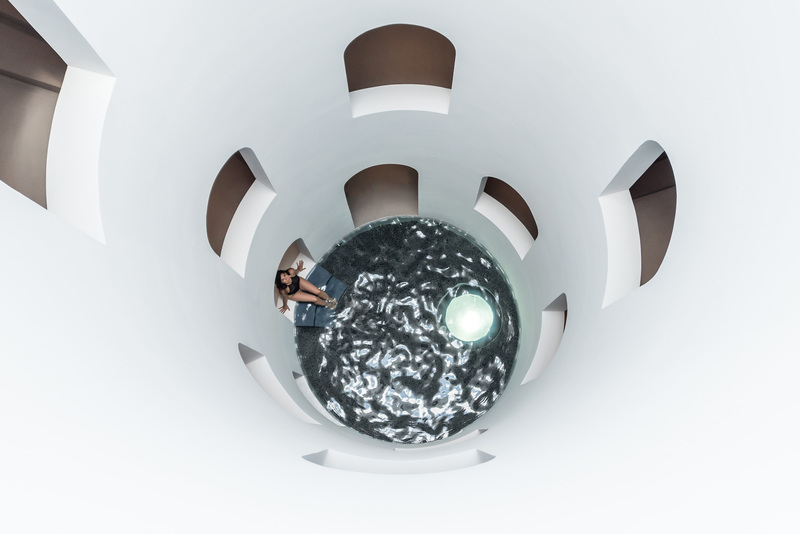 At the spa’s heart, a 25-metre-deep well, surrounded by an Escher-esque spiral staircase, represents the space at our core that can welcome the divine light. A contemporary spa driven by the Five Elements. Along with the chirrup of cicadas, the air is heavy with the perfume of cypress and pine. In the solitude of ruins and stone walls, the occasional lizard darts into the shadows. Here and there are carvings of the double-headed eagle and the fleur-de-lys—emblems of Byzantine emperors and their Latin brides. 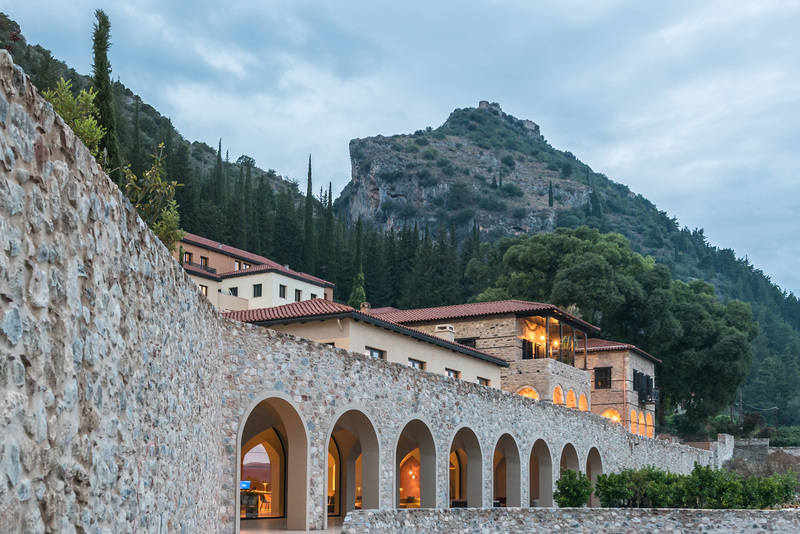 This place is Mystras, a fortified city that cascades down a slope of Mount Taygetos in the south of the Peloponnesian peninsula. Once the thriving seat of the Byzantine Despotate of the Morea, it has been fought over by Franks, Byzantines, Venetians, and Ottomans. It has been abandoned—but for five nuns—since the 1830s, and only some 20 monuments remain: a palace, a few aristocratic homes, and half a dozen churches and monasteries from the 13th century. It is one of the most numinous places in Greece. It is no coincidence that Euphoria Retreat, a new destination spa, is located near the foot of this UNESCO-protected site. If this sounds like an appealing philosophy, Efraimoglou’s story exemplifies it. Recovering from a type of cancer with a 25 per cent survival rate compelled her to reassess her life and leave her career in banking. She retrained in energy medicine in the United States, then Taoism and traditional Chinese medicine in Thailand with experts from around the world. Returning to Athens to study ancient Greek Hippocratic healing, she has taught transformational workshops for the last decade. Euphoria, a 22-million euro ($34-million Canadian) project that opened in July 2018, is the culmination of her dream. While you can expect all the familiar offerings of a highly equipped spa plus some particular to Euphoria (gym-based and outdoor fitness classes, aerial yoga in an olive grove; saunas, steam rooms, and a magnificent Byzantine marble hammam; numerous facials, massages, and treatments), the central message is delivered through lectures and transformational retreats based on the Five Elements theory (Water, Wood/Air, Fire, Earth, Metal/Ether) common to both Chinese and Greek philosophy. The focus is on how the elements relate to the energy of the seasons, how they affect the way we feel emotionally and physically, and how they point us toward our individual spiritual path. As Efraimoglou explains, each element is associated with specific organs and meridians of the body, colours, and emotional tendencies. By understanding your element, you gain the tools to transform your lower emotions into corresponding higher spiritual values. In short: a path to fulfillment, well-being, and happiness. My personal aha! moment was when I realized I was a Wood-Metal type (Air-Ether in the Greek system). My knotty predilections, predispositions, and temperamental quirks suddenly unravelled into a neat nexus of sense. Less surprising was that I have virtually no Earth energy and an imbalance of Fire. This is, of course, a gross simplification of a system with labyrinthine ramifications. The point is that techniques and treatments are offered at Euphoria to rebalance specific elements in the body. There are guided meditation sessions focusing on your particular affected organs, yoga devised for your elemental needs, and, in my case, water treatments (to quench the Fire), massages to stimulate the meridians for spleen, pancreas, and digestion (all related to my depleted Earth element), and chakra rebalancing to draw the energy from my head to my feet. 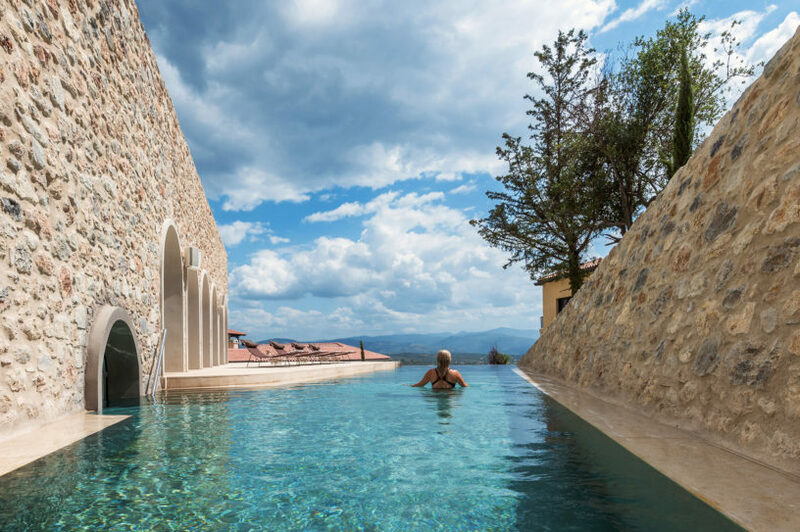 For all the esotericism and philosophy involved, the amount of emphasis on acceptance and intention, sessions never strayed into fancy, and together with pampering treatments and early morning hikes in the mountains, they activated a powerful reset button. In this beautiful environment, the very architecture is enlisted to echo the holistic message of the Euphoria Methodos. 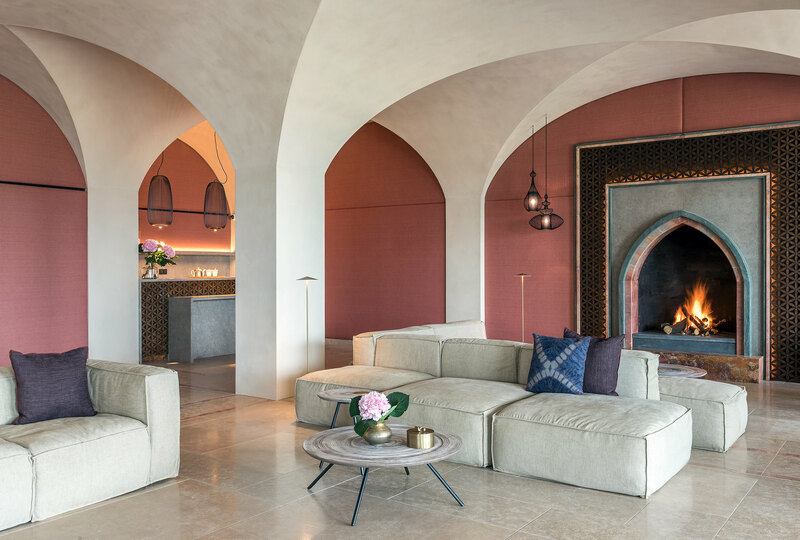 Natural materials in the 45 rooms and spa evoke the elemental connection between macrocosm and microcosm, while symbolism is incorporated into the design to subliminally reinforce the East-meets-West synthesis. Domes and arches of burnished gold, abstract fabric patterns derived from pixelated icons, hint at the Byzantine spiritual and cultural heritage of Mystras. Instances of sacred geometry and the flower of life, common to many cultures, abound in decorative details. To these antique references are added futuristic touches. 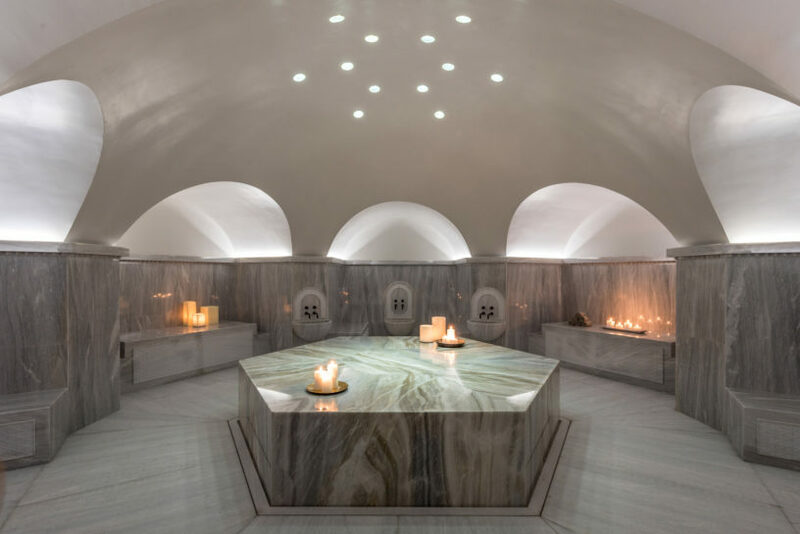 The four-storey spa is partially sunk into the ground—not only for environmental reasons, but for immersion in the grounding, healing power of Earth. At the spa’s heart, a 25-metre-deep well, surrounded by an Escher-esque spiral staircase, represents the space at our core that can welcome the divine light: sun above, moon below. 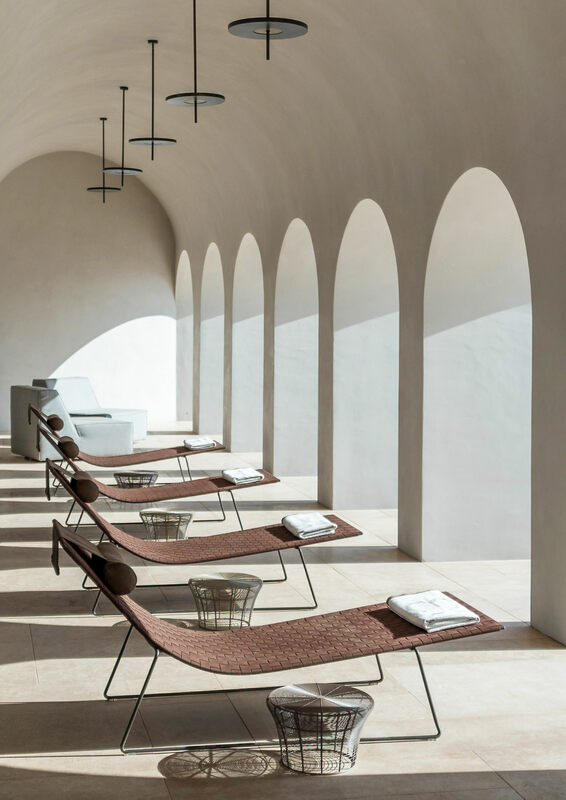 But the most dramatic symbolism is reserved for the space-age indoor hydrotherapy pool: a circular, womb-like, crepuscular area whose waters flow through a narrow opening into a long, phallic extension extending into the dazzling Mediterranean light. It is the interplay of yin and yang in its most basic form. Those of more pragmatic bent will welcome the involvement of Dr. George Leon, specialist in metabolic medicine, who brings the cutting edge of biological and cellular research to bear on nutrition. Food at Euphoria is healthy, local, seasonal, mostly organic, inventive—and, following the Aristotelian principle of pan metron ariston (everything in moderation)—deliciously inclusive. Cheeses, meats, and desserts are all permitted. Twenty-first-century science supplements these meals with twice-daily smoothies, herbal infusions, and snacks specifically concocted to optimize levels of the endogenous antioxidant, glutathione, in your blood and balance your metabolism—measured through a pin-prick test and vital to cellular longevity and protection from a range of metabolic diseases. I loved the easy, non-proscriptive nature of Euphoria. You can mix and match therapies, choose to attend lectures and exercise classes, or not. Those not on a personalized fitness or nutritional plan can eat ad libitum here and still somehow lose weight in many cases. Alcohol, though not encouraged, is available. And no one interfered with my cups of thick Greek coffee, which I drank while watching dawn break over the distant Parnonas mountains. “Your life, your journey,” goes the motto of Euphoria. At this unique spa, the choice is yours.